Discovering YOUR ancestors’ history from photographs. 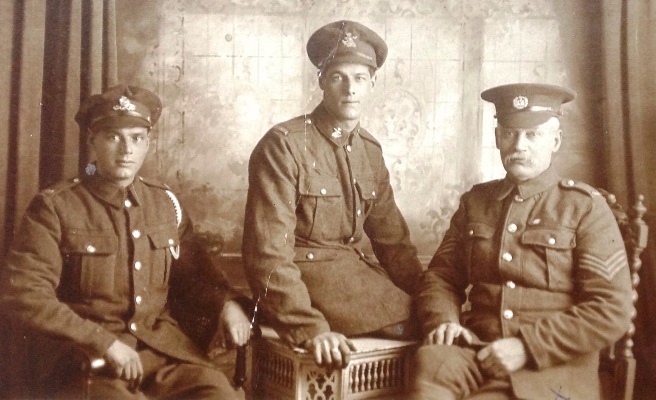 They say ‘a picture paints a thousand words’, and in some respects that is true, and especially so when it comes to examining old photographs… Forces War Records can offer a 'photo and document recognition' service, which could help you learn more about the military individuals in your family. Before you start researching your ancestors it might be worth talking to other family members and examining old photographs and memorabilia for clues. Uniforms, badges and sleeve marks can reveal a tonne of detail if you know what you are looking for and this could give you a much better starting point for your research. Forces War Records understand that not everyone has a great depth of military knowledge, if any, and that’s why we have our Photo & Documet expert help. You can send your photos in to Forces War records and ask our experts to help you decipher the meanings to certain badges and insignia that your ancestor is wearing in a particular photo. This could suddenly give you a fresh lead for you research — for example from a picture you could find out what your ancestor did in the military, what unit they were with and how long they served for. That sort of data could really help you jump hurdles in you genealogy research and help you more efficiently search records from the very off. Did you know that all regiments and corps are numbered or named with their own badge designs? Shoulder titles were also adopted in later periods and titles were also woven into the shoulder area of the uniform or pinned onto epaulettes. Once you know what you are looking for you will find clues everywhere and though the badges and titles changed frequently — each regiment’s cap badge and title is unique. This is how a photo can really work wonders for your research. And when you have information like that you can then search records more specifically by selecting a defined unit and/or narrow time frame, making it far easier to pick up that genealogy needle in a haystack. Military insignia on uniforms include large inverted chevrons and pips that can help you identify rank. 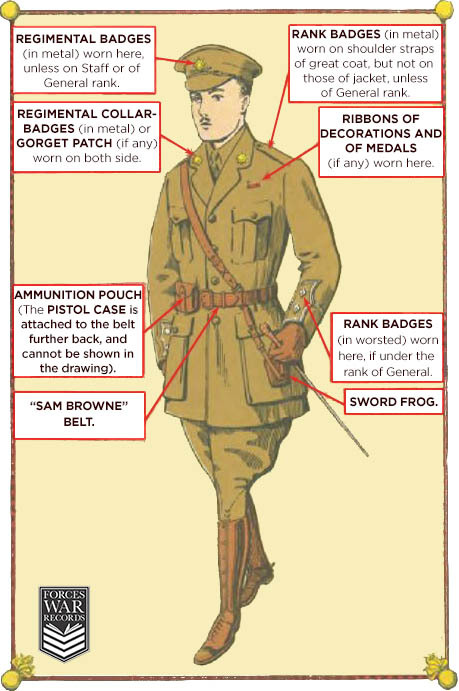 As a soldier went up the chain of command certain insignia was essential for other soldiers to identify levels of authority. Trade and proficiency badges were normally worn on the upper sleeve by soldiers to indicate that they were trained in a specific area or to a certain level. Some were woven but the majority were brass badges and are fairly clear on photographs. Battle stripes were cloth badges that represented which formation a man belonged to. The main fighting formation in World War One and Two was the division and every division had its own badge or insignia. Sometimes these were worn on the upper sleeves or painted on helmets and some even indicate what brigade within a division a man was in. A British army serviceman’s lower sleeves can detail of the period of service and also whether he was wounded. Before 1914 men were awarded inverted stripes which were sewn into the lower left sleeve to indicate the length of good service — two years for the first stripe and five years for a second stripe and 12 years for a third. In World War One a whole series of different schemes were used but not uniformly and some chose never to use the insignia at all, which is what confuses the matter more. There are lots of contradictions and variations when it comes to this subject, which is why you might find our photo expert service useful. You’ll need to have a fair bit of military knowledge to read military insignia — it’s a highly complex subject that can not be rounded up in a single blog post and we haven’t even touched the insignia of the Royal Navy or Royal Air Force yet. But, hopefully this has given you some insight into how old photos and memorabilia can help you greatly with your research. Let us help you work out what regiment your ancestor served with, or what certain rank slides mean. We could tell you a little more about what gun someone is using, or what aircraft they are in. Let Forces War Records help you fill in the missing pieces to your genealogy research.